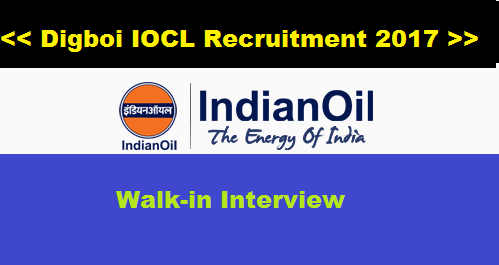 The Indian Oil Corporation in short IOCL , latest job notification is declared. The Digboi Oil Refinery which is India’s oldest operating refinery and one of the oldest functioning refineries in the world has recently invites Indian candidates in a walk in interview for filling up various faculty positions at its Assam Oil School and College of Nursing, Digboi . The vacant positions will be filled purely on contractual basis. Its a great opportunity for those who are seeking iocl jobs for a long time. Check the Details of Digboi refinery IOCL Assam Recruitment given below. Following are the details for IOCL Digboi Oil Refinery Recruitment 2017 for various faculty posts with required Educational qualification , pay band , Experience required, mode of selection. Must have done MSc in Nursing . Post Qualification Work Experience : Must have 3 years teaching experience in Nursing. Desirable: Ph. D (N) Consolidated. Pay band : Rs. 24,000/- plus one increment @ 720/- for each year of relevant experience. Pay band : Rs. 20,000/- plus one increment @ 620/- for each year of relevant experience. Eligible and Interested candidates[only Indian citizen] fulfilling the above eligibility criteria may attend Wail-in-interview as per the following schedule at any one of the two venues mentioned below. * Candidates for the post of assistant professor & Lecturer will be selected on the basis of Interview. * Candidates for the post of Tutor/Clinical Instructor will be selected o the basis of Personal Interview, Class room teaching technique and writing skills. Candidates appearing for the above posts are required to produce CV/Bio-data along with supporting documents wrt Age, Educational Qualification (from HSLC onwards). etc. They should clearly specify the nature of the job/assignments hand.. duration & last emoluments drawn etc Photostat copies of all the documents be submitted along with a recent passport size photograph. The above are required submitted by the candidates at the time of interview. For all positions candidates must possess a basic university or equivalent qualification down in the schedules of the Indian Nursing Council Act, 1947 and the prescribed qualification should be from a govt recognized university/institute.